FIRST ENGLISH LUTHERAN CHURCH was organized in 1894, and in 1896 built a small Romanesque style church in the 800 block of Edmond Street. The church's first organ was the one manual Hook & Hastings organ, originally installed in the James L. Ellingwood residence, which was purchased from the estate by the Altar Guild in 1903. According to a church history, in 1912 Dr. George S. Murphy accepted the call to become the congregation’s fifth pastor on the condition that a vested choir be established. He also introduced the used of a pastoral robe. The congregation was in need of larger quarters, having absorbed members of the Swedish Elim Lutheran Church, which had disbanded. Dr. Murphy engaged R. C. Gotswald of Springfield, Ohio, to draw plans for a new building. Gotswald was the son of a Lutheran pastor and seminary professor, whose brother served as Secretary of the Lutheran Board of Education. Practically donating his time, he drew plans for many Lutheran churches. A building site on the southwest corner of 10th and Charles, known as “Sam Jones Hill”, for a well-known evangelist who conducted tent services there, was purchased for $14,500 from Joshua Motter, who lived across the street. The Moose Lodge offered $22,000 for the Edmond site, contingent upon immediate occupancy. The church was able to meet this requirement by using the former Elim Church property at 1510 Messanie Street for temporary quarters. The new church and adjoining parsonage were erected by the Church Council and not by general contract for the sum of $62,000. The Gothic revival style church, faced in Bedford limestone was dedicated in January 1914. It features a modified Akron Plan, with a “straight” Sunday School assembly hall, which doubles as a chapel, adjoining a “straight” rectangular sanctuary, separated by a large door which disappears into the floor. Most of the stained glass from the former building was incorporated into the present church, along with two large, new windows, created by the St. Joseph Art Glass Co. The M. P. Moller Co. installed a new, two manual pipe organ, which was replaced by a two manual Wicks organ in 1961. In 1996, the organ was rebuilt by Michael Quimby, who replaced the original console and relays and added a new Mixture and Tierce. The existing pipework was revoiced and rescaled by John Hendriksen, former head flue voicer for Aeolian-Skinner. 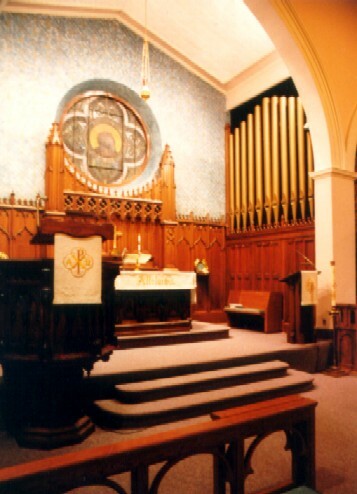 In order to take advantage of a three manual Moller console from the former First Methodist Church, and the flexibility of the new relays and Direct Electric chests, which allows infinite unification and duplexing, stops from the Great and Swell manuals were duplexed to the Choir manual. The organ is totally enclosed in one chamber and has 21 ranks.